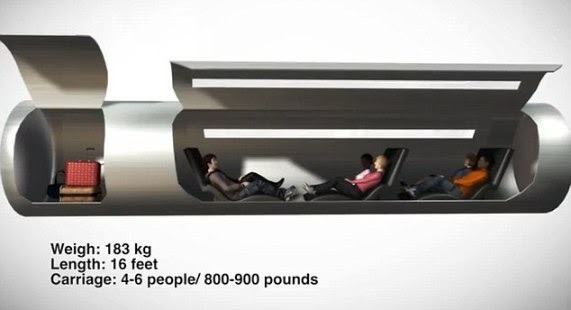 Paypal billionaire Elon Musk, inset, has revealed plans for a radical new 'Hyperloop' transport system that could 'shoot' passengers from Los Angeles to San Francisco in 30 minutes. ‘It would have less lateral acceleration—which is what tends to make people feel motion sick—than a subway ride, as the pod banks against the tube like an airplane,' he said. 'The Hyperloop (or something similar) is, in my opinion, the right solution for the specific case of high traffic city pairs that are less than about 1500 km or 900 miles apart,' he claimed. Inside the tubes, hyperloop pods are mounted on thin skis made out of inconel,an alloy already used by Musk’s SpaceX firm that can withstand high pressure and heat. Air is pumped into the skis via small holes to make an air cushion, and each pod has air inlets at the front. An electric turbo compressor compresses air from the nose and routes it to the skis and to the cabin. 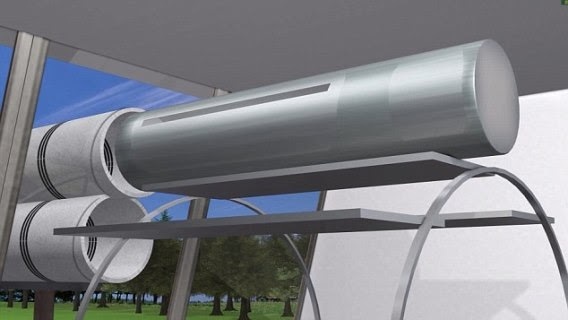 Magnets on the skis, plus an electromagnetic pulse give the pod its initial thrust; reboosting motors along the route would keep the pod moving at just below the speed of sound so the system does not produce sonic booms.